Ever wondered why a city has that strange name? Us too – so we set out to do some research and get to the bottom of it. Cities across the United States have names originating from dozens of languages – reflecting the melting pot of cultures and languages across the country. The windy city has a vaguely French name to most who come across it, but its literal meaning is even more surprising. 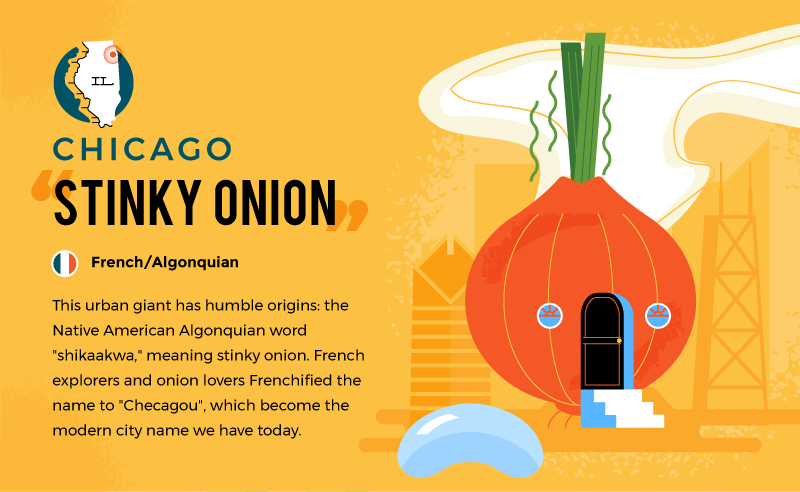 French settlers had trouble pronouncing this word, but given how important onions are in French cuisine, it’s easy to see why the name stuck. 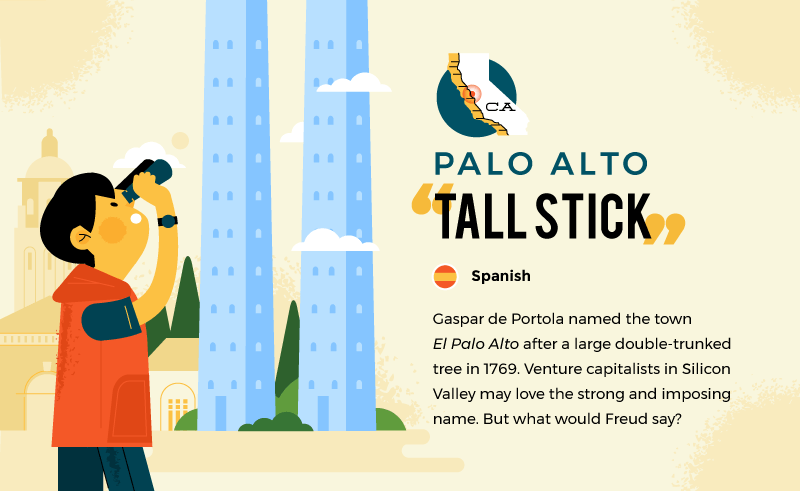 Palo Alto, CA is the heart of the tech scene, but it was once just another California town created by Spanish pioneers. Venture capitalists in Silicon Valley may be delighted to learn that the meaning behind Palo Alto is so strong and imposing. 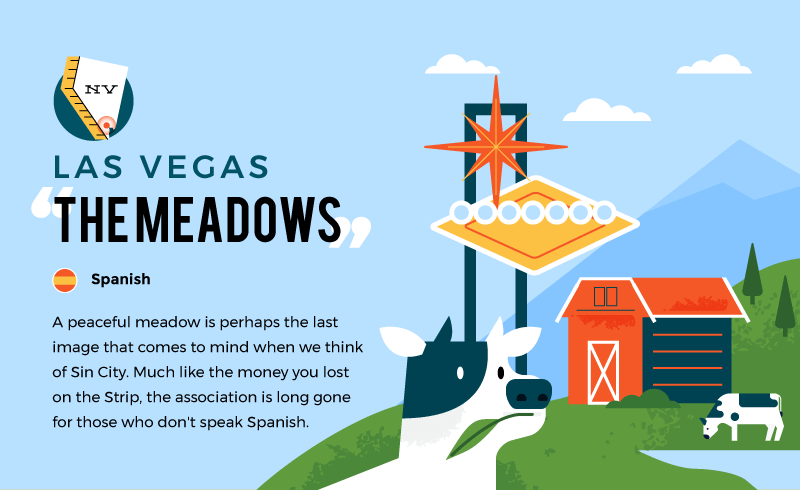 Las Vegas is the entertainment capital of the world, yet it was once a more humble region. We love the ironic naming for the international capital of vices. 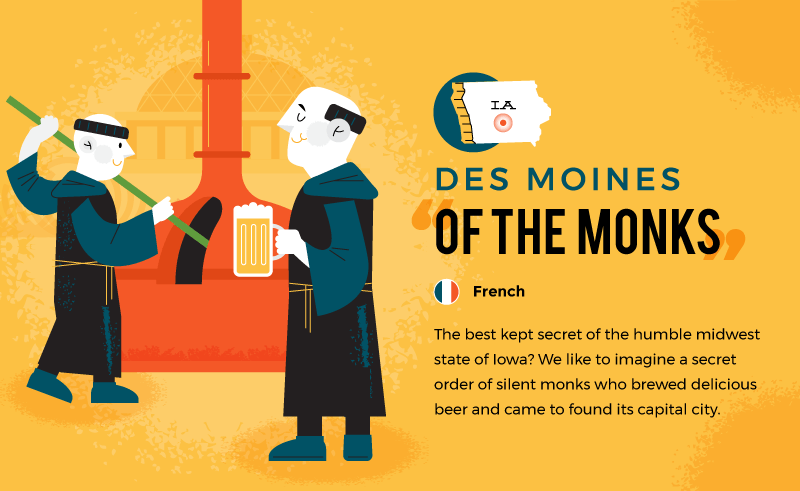 While the true origin of the name is up for debate, one influence for sure was the Trappist monks (moines de la Trappe) who established a monastery at mouth of the Des Moines River. Other influences include the Algonquian name for the river, Moingona, as well as the French word for middle, “de moyen”. We like the idea of the monks and their brewing, so we’ll focus on that. As beautiful as Montana is, the winter is dark and full of frozen water. 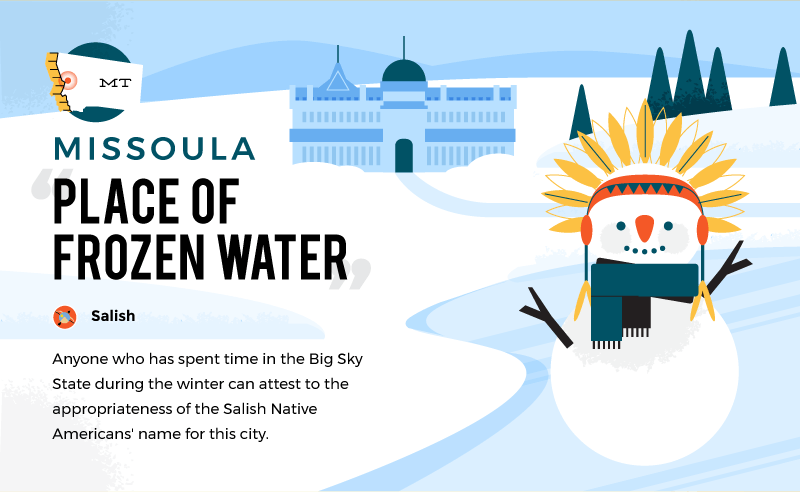 A Native American tribe named the Salish named this region after the harsh geographical feature, perhaps as a way to keep others far away. 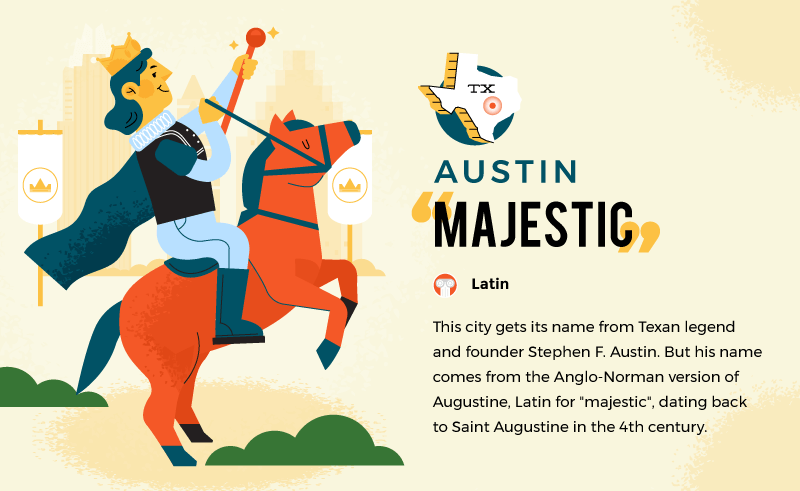 While originally named for a Texan hero, the origin of “Austin” is ancient. The surname turned city name is an Anglo-Norman version of Augustine, latin for “majestic”, or “venerable”. Given the rise of Austin’s growth in recent years, the city is starting to live up to its name. Honestly, this is probably our favorite one. The great state of Florida was crawling with creatures – everything from intimidating alligators to harmless mice. 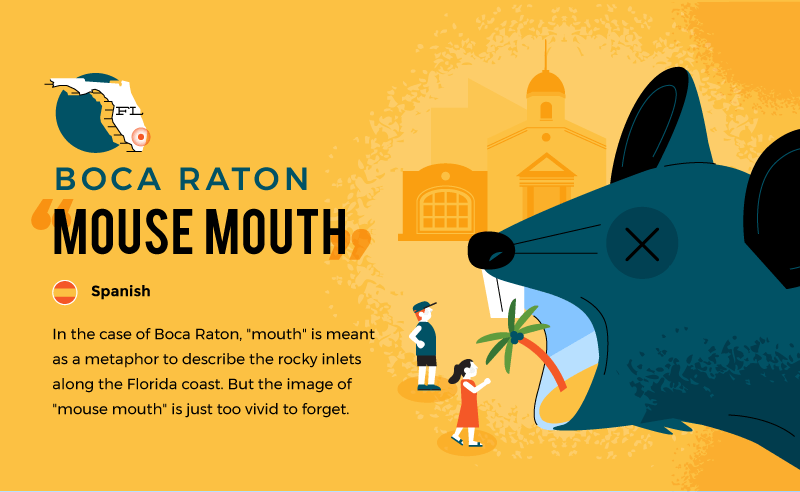 Mouth is “boca” in Spanish, and mouse is “raton”- meaning “mouse mouth” is the literal translation. 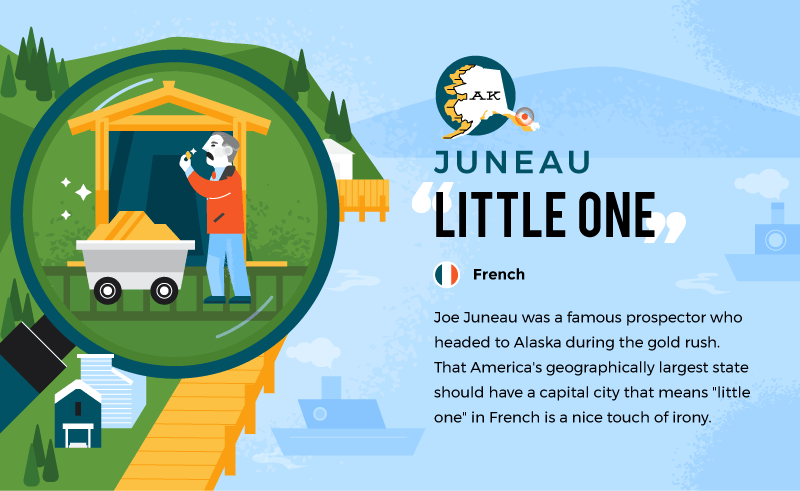 This small Alaskan town got its boom during the Alaska gold rush era, and was named after prospector Joe Juneau. The translation of “little one” adds a mystical feel to the region. 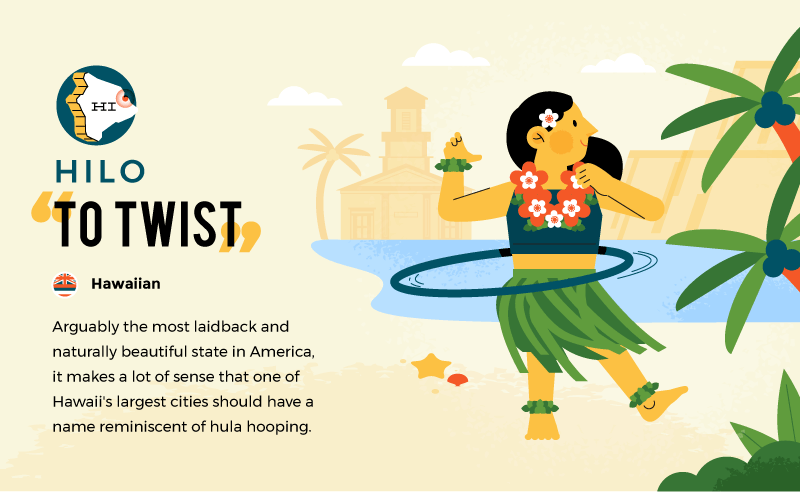 Perhaps the most beautiful and carefree U.S. state, it’s a land of hula hoops and luaus. The translation of Hilo meaning “to twist” makes a lot of sense here.